The motley world of Vienna’s Wurstelprater is always worth visiting, as it inspired artists of all times. This highlight is only a few minutes’ walk away from the WienerART Hotel Wilhelmshof. 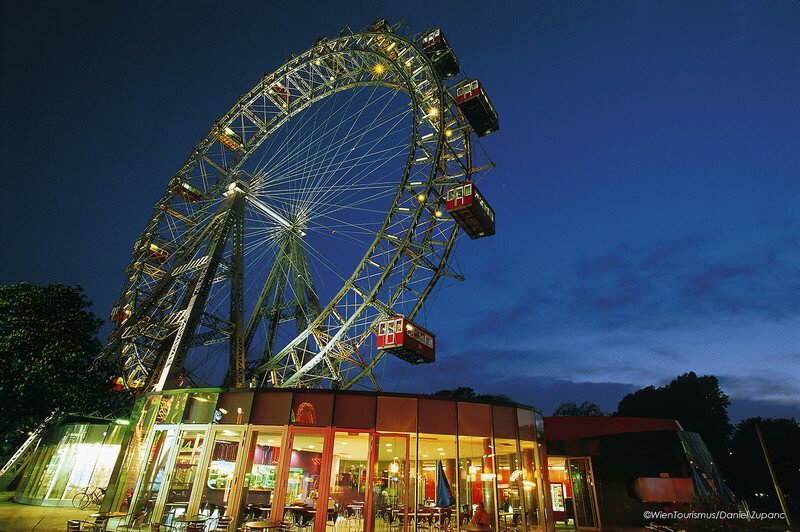 The Prater’s history started in 1766 and is still the most popular and historic amusement park of the Viennese, offering a multitude of leisure activities. 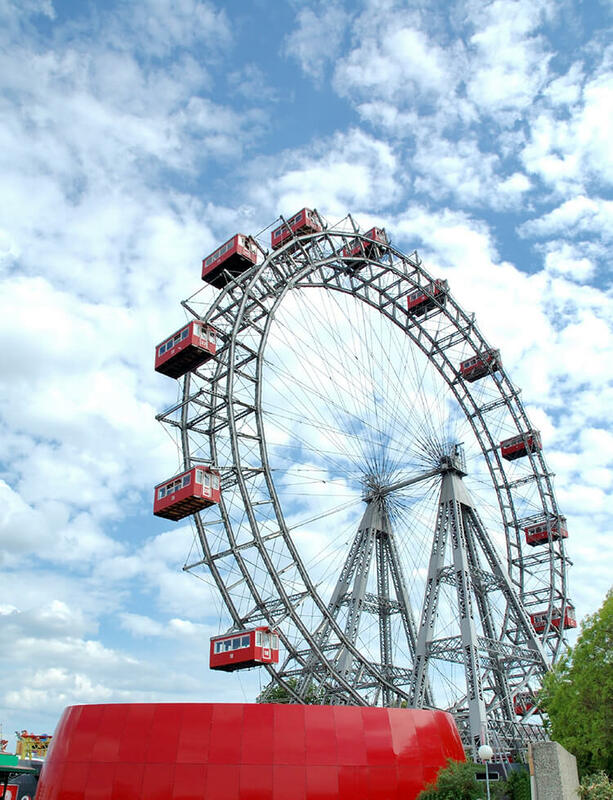 One of Vienna’s most famous symbols is the Ferris Wheel. If you are looking for an adrenalin rush, you will certainly find your kick in one of numerous modern attractions. The Prater features the world’s oldest wooden slide, the chair-o-planes, Madame Tussauds wax works and many other exciting attractions. Young and old have a blast at the Prater – and roller coaster, the Alt-Wiener ghost train and the Vienna Ferris Wheel are even more fun when the weather is kind. 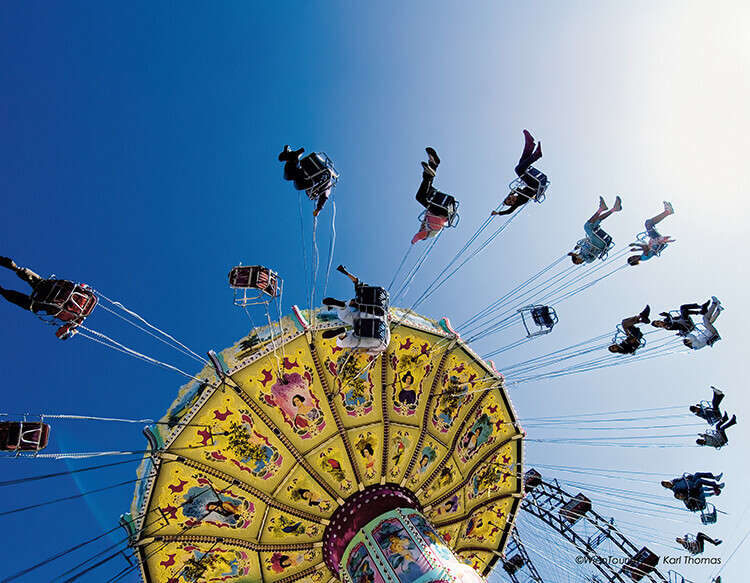 According to the FOCUS magazine, the Prater is one of the top-ten most beautiful urban green areas in the world. You will find this popular venue only five minutes away from our hotel. Once this used to be the emperor’s favourite hunting ground, reserved for him and the nobles only, but in 1766, Emperor Josef II donated the whole recreation area to the Viennese citizens. The Wurstelprater (Wurst meaning sausage) owes its Name to a fictional character in the Prater called “Hanswurst”, created by Josef Anton Stranitzky. By the end of the 19th century, you would hear the melodies of barrel organs, Heurigen singers and the world-famous composer and musician Johann Strauß. This picturesque scenery was accompanied by kid’s laughter, merrily watching the wooden puppet theatres, starring funny Hanswurst in the leading role. Even back in those days, numerous attractions called fully-throated for the audience’s attention. When the coffee house and pub owners also came to establish their businesses, today’s Wurstelprater developed quickly and it did not take long until attractions such as big swings, bowling alleys and the famous roundabouts followed. After so much excitement, most visitors want to have a hearty bite and thus many visit the Schweizerhaus (Swiss House). Founded in 1868, the Schweizerhaus started under another name and at a slightly different location. Back then, the guests used to dine fine seafood and listened to Ludwig van Beethoven’s classic music. When the new owners took over, the place became more casual, serving the hearty Viennese cuisine including the Stelze (pork knuckle with a crispy crust). Among the guests of the Viennese Schweizerhaus and its beer garden are Helmut Qualtinger and André Heller. The different segments of the beer garden are named after the Viennese districts. Another Prater highlight is the Wiener Wiesn (Viennese Oktoberfest). From the end of September until beginning of October, the fest celebrates Austrian culture, featuring one Austrian province each day. Entrance to most of the beer tents is free and people dance to the music in their traditional costumes. If you want to bring home something typically Austrian, you should get yourself a Dirndl or some leather shorts. The Wilhelmshof Blog – We are here for you!